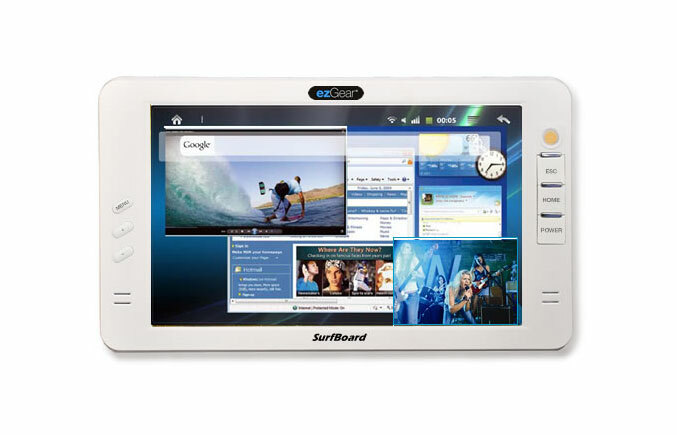 The SurfBoard 700 is a seven inch Internet Tablet computer by ezGear that is based on the Google Android 2.1. The ezGear SurfBoard 700 comes with great features like its own built in Wi-Fi support, a 2 megapixel digital photo and video camera, front stereo speakers, built in microphone and an ergonomic built in mouse. It weights at only 17.6 ounces and is a little more than half an inch thick. Its height is less than five inches (approximately 4.73), with a seven inch wide touch sensitive screen and a high-resolution display at 800 x 480 pixels. Consumers can use the ezGear SurfBoard 700 to browse the internet, watch high resolution movies and videos in up to 720p or just read an e-book. The SurfBoars supports thousands of Applications from the Android market. The ezGear SurfBoard 700 also supports interfaces like the USB 2.0, USB OTG, HDMI, and of course, the 3.5mm Audio. It has a long lasting battery life in up to twenty hours for music and up to ten hours for Videos. The Micro SD Slot of the device allows the consumer to add up more memory to store his digital movies, songs, and books. Google Applications Google Android Market, GMail, Google Maps, 30,000+ other Apps can be downloaded from Android Market.